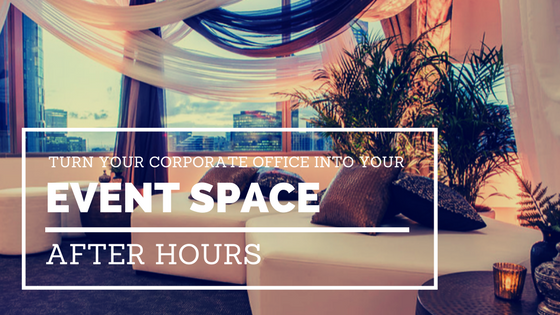 Is your corporate office your next event venue? According to Rasmus Bech Hansen the CEO of Airfinity more and more events will be taking place in the corporate office and not at an events venue. Inviting your current and future clients into your corporate office means you have to put your best foot forward. There are many ways to transform your boardroom into a lively environment. With the help of simple decorations and installations, lighting, sound equipment and the right catering, your guests will soon forget that they are in your corporate office, relax and be in the best frame of mine to network and connect. If you don’t have a preferred caterer that you work with, there a number of options. You can talk to a cafe near your office and ask about their catering services. Doing this will support your local business and will help build great report. Alternatively, you can go with a more generic solution like Subway. Or engage a quality catering company that specialises in corporate functions that will be able to cater the event and provide staff to set up, serve and pack down. Your choice of catering will depend on your guests and your budget. Deciding on a theme, choosing decorations and setting up for your event can be hard work if you don’t know what you are doing. Working with an event management team can help save you time, which we all know is a valuable commodity. If your needs aren’t too elaborate and your guests don’t require much wining and dining, you could work directly with a consultant that will help you style your space and set up your audiovisual equipment to get the best results. To entertain your guests you will need music. Whether you choose to go with a live band, a DJ or plug in your own playlist you will need the right audio equipment to set the right tone. Lighting can be a great way to change the atmosphere from a corporate boardroom to a lounge feel. The right type of light will create a great ambience/mood lighting. And if you are looking to engage and MC and speaker for the evening, you will need microphones, screens and speakers to have the greatest impact. A good audiovisual consultant will be key in getting your technology just right. Pro Light & Sound are the experts in setting up audiovisual technology for corporate events and private functions. Engaging a Pro Light & Sound technician will help you bridge the gap between the corporate boardroom and the networking lounge.